Explore the natural beauty and embrace the thrilling adventures of both Chile and Argentina on a hand crafted itinerary! Guided through the eyes of local experts, you will have the chance to admire the famous city highlights and uncover hidden treasures off the beaten path. From exploring the wonders of Torres del Paine national park in In Chile to Ice Trekking and seeing the massive Fitz Roy Mountain in Argentina, you will have an adventure of a lifetime, in the heart of Patagonia. A city, which for many years has played second fiddle to Buenos Aires and Rio, Santiago is used to being the underdog metropolis in South America. However, since it's 200-year anniversary, public work projects have aimed to rejuvenate a once stale region, into a desirable destination in itself. 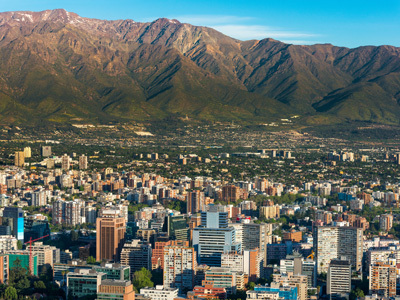 The result is that now, more than ever, Santiago is turning into a city worth visiting. New and trendy restaurants, modern hotels, excited locals and bustling shops combine for the perfect gateway to Chile. Patagonia inspires the passion behind Chile's final frontier. Idyllic for bold adventurers, so much of this fascinating region radiates the feeling that it has yet to fully be discovered. The unspoiled settings, exclusive experiences and tranquil nature, promises the ultimate paradise for outdoor explorers and intrepid backpackers. Even as its popularity grows and accessibility increased, the Chilean Patagonia will always offer a remote retreat, unplugged from the chaos of reality. After all, that is what makes it truly irresistible. You will have three full days to enjoy Torres Del Paine National Park and the incredible all-inclusive excursions provided by Eco Camp. EcoCamp is situated in the very heart of Torres del Paine National Park and provides the region’s first fully sustainable accommodation, complete with green technology. You enjoy guided treks and wildlife excursions by day and share evening meals with new friends, before falling asleep gazing up at the star-filled sky through your dome ceiling. Wake up in the middle of the Patagonian wilderness in a cozy geodesic dome, with a panoramic view of the majestic Torres Del Paine, ready to pick up the hiking trail! Each day offers different activities which will be posted in the lodge on arrival. 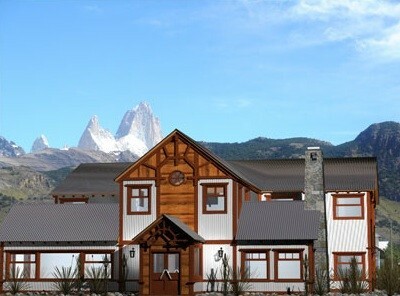 El Chalten is nestled in the heart of the Southern Patagonian Andes, at the base of the iconic Fitz Roy Mountain. This destination is an adventure lover's paradise, with close proximity to the Los Glacieres National Park in the north. The region offers everything from leisurely walks that showcase epic lookout points, to expedition style trekking and even mountaineering. Other activities include camping, climbing, horseback riding, fishing, bird watching or visiting the legendary Estancias in Santa Cruz. No matter what you are here for, El Chalten promises to keep you captivated. 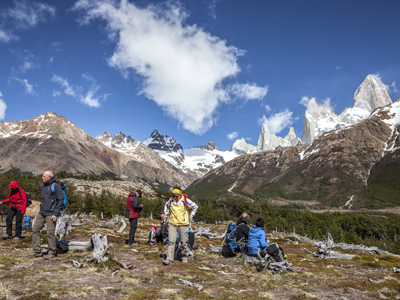 Enjoy the opportunity today to head out on one of the most classic treks of El Chaltén. This guided adventure will take you to the Torre lagoon, at the foot of the amazing Adela range, Torre and Grande glaciers and the incredible Cerro Torre. Ten minutes before arriving in the lagoon, you will reach the DeAgostini base camp. Just getting to the Cerro Torre viewpoint, halfway and just two hours from El Chalten, allows you to witness one of the most majestic mountain landscapes in the world and one of the mythical mountains of Patagonia: Cerro Torre! With a difficulty level of moderate, this trek will be roughly four hours in each direction, with an elevation of 200 meters from El Chalten. The best season to embark on this hike is typically from October, until May. 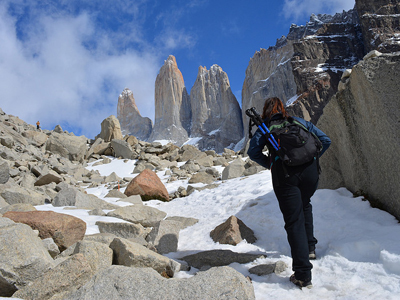 From El Chaltén, there are two head-trails to Laguna Torre, though both paths join together after 5 minutes walk. The trail enters the Fitz Roy river valley and continues following the river upstream, to its source. At only 15 minutes walk you will access the first viewpoint, which is located at the gorge of the Fitz Roy river, called Cascada Margarita. Here, you can marvel at panoramic views of the Cerro Solo, Adela range, Cerro Torre and Mount Fitz Roy. Across the river, lies the Margarita waterfall. Halfway there, you will reach the Cerro Torre viewpoint with unforgettable views of the Adela range, Cerro Torre, and other granite needles. Finally, the path crosses the DeAgostini base camp, where only fifteen minutes along the way from the camp, you will reach Laguna Torre. You did it! At the shore of this lagoon, it is often possible to find a number of icebergs from the Grande glacier. Although your adventure must come to an end today, you will be leaving with new friends, amazing experiences and memories to cherish for the rest of your life. Once you have checked out of your hotel, you will be met by your driver and transferred to the airport in good time to board your international departure flight. Following a meticulous two year full renovation of a 1929 mansion in Santiago’s historic downtown, you will now find the world class Hotel Magnolia lying in the heart of the city center. This 42 room property is the first of its kind in the city’s “El Centro” neighborhood. This area features a seamless fusion of the city’s past and its future, offering historic beauty that blends together with the luxurious accommodations, gourmet restaurant, and a perfect location at the foot of the Cerro Santa Lucia hilltop park. Sit back and relax on the lovely rooftop outdoor terrace, to soak up the true essence of Santiago and make the most of your stay. EcoCamp Patagonia is an innovative leader in wilderness adventures, with expert guides to take you through the rugged Patagonian plains, past glacial lakes, snow capped mountains, fierce waterfalls and exquisite wildlife. After an adventure packed day, EcoCamp's iconic lodging awaits. Dine with delectable cuisine, relax in the unique community domes and enjoy the privacy of your very own cozy Suite, Standard or Superior Dome. All domes are immersed in nature, resistant to the Patagonian elements and feature ceiling windows to admire the starry night sky. EcoCamp prioritizes its sustainable design and is internationally recognized for its impressive environmental practices. Within the epic Los Glaciares National Park, a the door of the magnificent El Chaltén, Hosteria Senderos awaits you! The 21 rooms and other spaces have been designed to offer guests warmth, privacy and peace of mind during your stay. Designed in the traditional Patagonian style, with inspiration drawn from the old farms of the past - yet all the modern comforts - Senderos offers a warm and personalized refuge in this most stunning of regions. This is just one of many authentic travel experiences offered by Global Basecamps. If you are interested in more unique destinations to Chile with unprecedented planning and extraordinary service visit our main Patagonia tours page to browse other sample trips.